Whether you operate your business alone or you manage a team of driving instructors, our driving school websites at QuickontheNet.com will scale up or down to meet your needs. We are talking about QuickontheNet.com, the unique website template service from Quick on the Net Limited. If you buy a website design template from our designs web page, it will be supplied using the logo graphic, layout and style you see presented when you click-through to view the site in question. All designs include red or yellow learner plate pictures. All of the menu items and the site structure will be preserved when you make your purchase. In other words, it will be supplied ready for you to insert your own content. We provide international Driving School Web Templates, with pre-designed schemes for the UK, Ireland, Australia and New Zealand and they can easily be adapted for the USA and Canada. Presented in a red and white gradient on a black background with red learner plates, we have already designed a car logo for your driver training business. 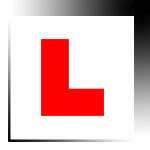 Driving school red L Plate logo web design template presented in red, white and black colours. Stylish driving instructor web design templates for Australia and New Zealand. Hosted learner driver training web design templates for Australia and New Zealand. Yellow, white and black are the leading colours in this design template. The design scheme is centred around the yellow L Plate graphic for Australia and New Zealand.